Roof tiles come in a variety of colors and shapes, many of which are designed to not only protect the roof from damaging weather conditions, but as decorative additions for our homes. In an effort to add an additional and productive use for these tiles, the people at Boral Roofing in the U.S. have created a roof tile for the purpose of pollution reduction. Located in the Los Angeles area, Boral Roofing is more than aware of the destructive properties of smog and has come full circle with their new ‘smog-eating tiles’. They have added a titanium dioxide coating to each tile, which has the ability to act as a photo-catalyst by oxidizing the typically harmful pollutants that are emitted by fossil fuel burning. The process occurs when the tiles are exposed to sunlight allowing the titanium dioxide to break down nitrogen oxides in the air and then turns them into harmless calcium nitrate. This washes off the roof with regular precipitation and acts as a garden fertilizer. The price is actually quite appealing, as it only adds around $600 to $1,000 to the cost of regular tile roofing. The tiles on a 2,000 sq ft home can oxidize enough nitrogen oxides to equal driving 10,000 miles in a standard car. The technology was actually introduced in Japan and has been in use in Europe for a number of years. The success of the technology has been of such high excellence in pollution reduction that many companies around the world have adopted it of a number of industries, including eco-friendly architectural panels, paints and cement products. 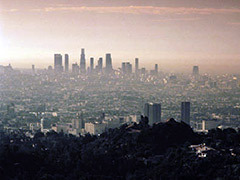 The effects of smog in some cities around the world have already been linked to higher death risks of stroke and heart disease and even the smallest pollution reduction can equate to saving not only lives, but the overall effect of planetary pollution. Posted on May 22nd under Pollution Reduction. Leave it up to the incredible people in L.A. and the Japanese to come up with this one. I’ve seen the towns and towns out there filled with rows and rows of houses (that all look alike), and so many of them have those clay tiled roofs. This is a brilliant idea and one that could clean up the air for LA and then take it to the rest of the world. If this technology works, it could open the door for other types of air cleaning products. This isn’t a reason to continue to pollute, but at least we can contribute to cleaning up the mess we have already created. Impressed with this concept. Can’t believe it took so long to come up with. Any time anyone creates something that helps the environment without causing more pollution in creating it, is a distinct advantage for all of us. It will catch up because the cost isn’t that much more. The more cost effective it is, the more people will use it. I am looking to see when this will be available for the rest of the country. This is a fab idea and we are thinking about building a house. I want everything to be as earth-friendly as possible.